In 2014 we agreed to support and help two villages in Malawi, Mbongondo and Makunkha along with 4 other Rotary Clubs in the area. Initially £2500 was sent to Malawi by the Clubs. This was used to transport and purchase materials to construct a bridge and re-point and repair the Community main building. This work was carried out by the villagers under the guidance of John Challis of ' Raven Trust',(Church of Scotland Charity). The Bridge and building repairs have been completed and we have received some photographs of the finished work. Unfortunately after a very severe rainfall and flooding there has been some damage to the bridge. The villagers have carried out repairs and the bridge is still in use but John Challis has just returned to Malawi and will visit the bridge to examine the repairs and consider if any adjustments to the construction are required. 1) Water Provision - Shallow Well. Rotarian Ian is seeking further details about the water source, the technology, the digging and the proximity of the well to the villages. Funds required - £800 approx. 2) Village Bank - To be run by the Women Villagers and will include training. 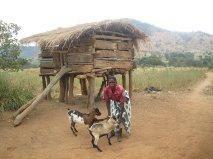 3) Goats - To help develop the villages self sufficiency and animal husbandry. These animals would provide milk, cheese and meat. Funds required - unknown number of houses . 2 Sheets per house required at £20 per sheet. Following damage to the Bridge, due to the heavy rains in the spring of 2014, temporary repairs were carried out by the villagers to maintain the use of the bridge. However following further flooding damage John Challis of Raven's Trust (our Charity Partner in this venture) who visited the site assessed that the bridge would need to be repositioned and the design altered to avoid any further difficulties. The work to move the site and reconstruct the bridge was carried out in a couple of months. The supporting Rotary clubs were asked to provide a further £250 to carry out this work. Our club agreed to this request and a cheque was issued in March of 2015. In addition to the bridge work the District Group had previously agreed to send funds to establish a Shallow well, a Village Bank and provide 20 Goats. This was calculated to cost each Club £370 and this was also agreed by our Club and the money sent June 2014. The arrival of the goats went down well as can be seen from the photos below. In total we have sent £1,100 to these projects. For 2016 we will be reveiwing our International Project and hope to have another 2 to 3 year project plan by mid-year.